NEW BRITAIN - Caught in a back-and-forth battle with New Britain on Monday night, the Plainville girls basketball team needed a boost to avoid the upset and earn a win against the Hurricanes. For Blue Devils head coach Jessica Neuweiler, she elected to lean on sophomore Jaida Vasquez from the opening tip through the final minute of play, when Plainville was clinging to a one-point lead on the road. Despite Vasquez’s grade level, Neuweiler knew her underclassman could handle the pressure. Vasquez rewarded her coach with a game-high 20 points, including clutch free throws down the stretch to help seal a 64-60 victory for the team’s third straight win. Vasquez, the team’s leading rebounder despite primarily playing point guard, also pulled down 11 boards to finish with a double-double. As Neuweiler pointed out after Monday’s win, the Blue Devils needed every one of Vasquez’s 20 points, even early in the game when the Hurricanes’ defense keyed in on Plainville’s 1,000-point scorer Caitlin Barker, who was held scoreless through the first quarter. While Barker took time to get going, Vasquez shouldered the offensive load for four quarters, providing an answer for every New Britain run to keep Plainville ahead. Vasquez, now the team’s second leading scorer, has become a focal point of the Blue Devils’ offense while showing the poise of a seasoned upperclassman. Vasquez has seen almost two full years worth of varsity playing time since arriving to Plainville last year, and in her two seasons of work, the Blue Devils secured back-to-back state tournament berths for the first time in five years. 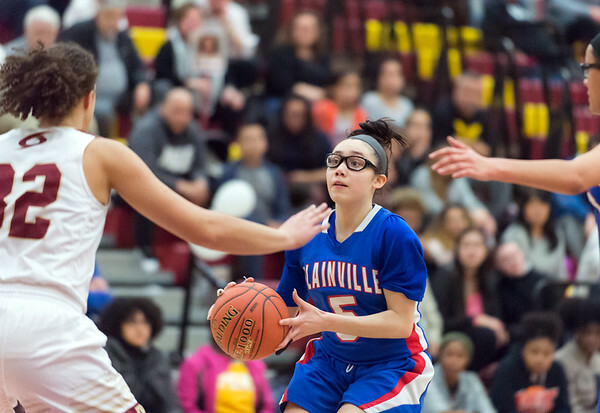 Like any winning team, Plainville needed a sure-handed point guard to anchor the offense, and Vasquez has taken the expectations in stride, improving every aspect of her game that Neuweiler and the Blue Devils needed from her. With just two games remaining before the postseason begins, the intensity will heat up for Plainville and the rest of the teams in the area that are tournament bound. Even when the pressure mounts and the season is put on the line, the Blue Devils have confidence their sophomore point guard will match the game’s intensity and put Plainville in a position to win, much like she did on Monday night in New Britain. Posted in New Britain Herald, Plainville on Tuesday, 5 February 2019 19:16. Updated: Tuesday, 5 February 2019 19:18.